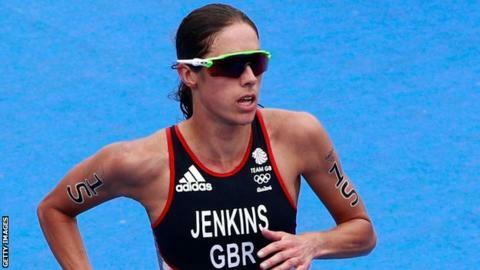 Double world triathlon champion Helen Jenkins says her latest pregnancy has taken her chances of competing at the Tokyo 2020 Olympics "off the table". The 35-year-old, who was hoping to compete again after giving birth to her daughter in August 2017 and having back surgery in 2018, is 32 weeks pregnant. But she admits she is unsure if she will be able to "get back to the top". Jenkins was speaking after collecting an MBE from the Duke of Cambridge at Buckingham Palace on Tuesday. "I was hoping to come back this year but my back was not ready. It was not good enough to compete at the highest level," said 2008 and 2011 world champion Jenkins. She added her pregnancy probably "takes Tokyo off the table". Jenkins was appointed an MBE in the 2019 New Year's Honours list and said she was delighted to share the news with her "biggest fan" - her grandfather David - before he died in December. "I found out in November and although you are not meant to tell anyone, I told him. He only had a few days left," she said. "He did know before he passed away and he was really proud." Scotland-born Jenkins, who has competed for Great Britain at three Olympics and Wales at the Commonwealth Games, added: "You train all the time to be the best athlete you can be but you do not imagine awards like this. "It is really lovely to be recognised for achieving in sport and also contributing to sport."